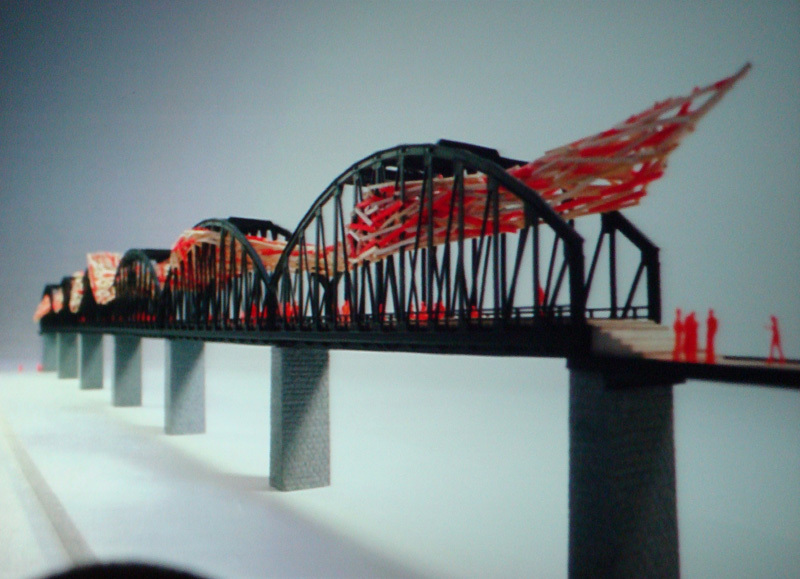 Today at the IdeaFestival, Studio Arne Quinze revealed its proposal for transforming the Big Four Bridge into a dynamic art installation weaving itself through the bridge’s iron trusses between Jeffersonville and Louisville. Quinze’s installation work is known for its unique construction of linear wooden sticks joined in an apparently chaotic but well informed manner to create large organic and fluid sculptures. The Big Four Bridge is an abandoned railroad crossing and part of the final phase of Louisville’s Waterfront Park, designed by Hargreaves Associates. The bridge, built in 1895, will be turned into a pedestrian walkway connecting Kentucky and Indiana. A dramatic spiraling ramp is being built to connect the bridge to ground level in the park. A smaller ramp is being built in Jeffersonville. In May of this year, the bridge deck caught fire after an inspection due to faulty wiring of a light fixture. The wooden bridge deck was damaged but the structure was unharmed. The announcement comes the day after Mark Beasley of public art firm Creative Time lectured to IdeaFestival crowds. Creative Time has just been hired by the City of Louisville’s Mayor’s Advisory Committee on Public Art (MACOPA) to draft a master plan to guide public art throughout the city. In addition to the cloud sculpture, the proposal lays out a program for the pedestrian walkway of the Big Four Bridge. Quinze envisions a timeline running across the 2,525-foot-long bridge detailing historical events important to the city’s growth. Earlier this month, De Leon & Primmer Architecture Workshop revealed its Happy Birthday Pavilion that could one day sit beneath the bridge and its spiraling ramp. 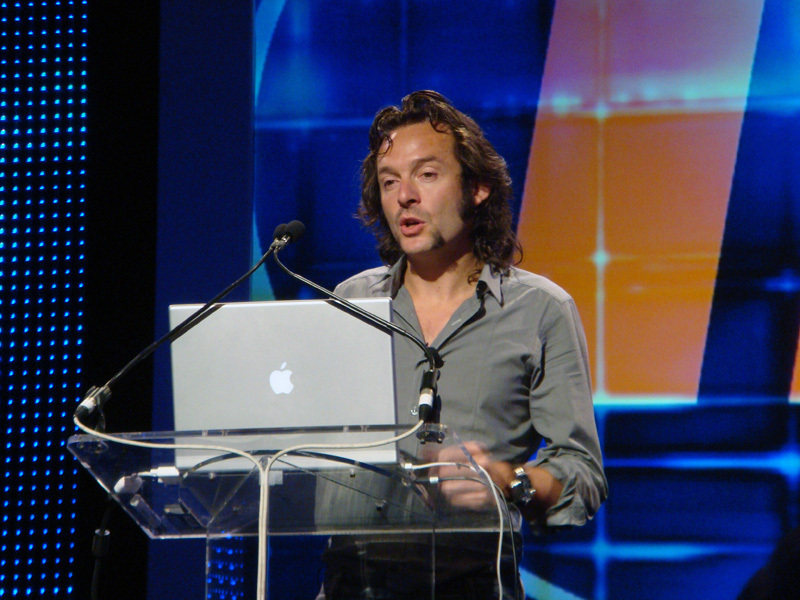 Studio Arne Quinze has worked on a number of public art installations including Cityscape in Brussels, Belgium; the Burning Man Pavillion in the deserts of Death Valley; a proposal for the Galactic Transporter for the Beijing Olympics; and a proposed Rebirth Pavillion for the Champs Elysees in Paris. I think is idea is amazing. I would love to see this happen. It looks like a giant radioactive shredded wheat biscuit has been unfurled atop the bridge. Why is it imperative to screw up a already wonderful example of a riveted steel bridge from the late 1800's? I think a nice coat of whatever color paint it was originally is about all thats needed. To build on Rob/idea man's idea…lets have the elves and fairies dressed as railroad engineers, firemen, etc., you know cause it was once a railroad bridge. They could sing, "i've been workin on the railroad" and such. Brightly dressed, pointy shoes and all. It would indeed be magical. Ugly. Try again. Here… I’ll throw out a better idea… I like ideas… they’re so cheap. I’m a freaking idea machine! Watch me go! I’d like to see a floating magical world of fairies and elves suspended above the bridge that grant wishes to all that cross the bridge. they could put on plays and light shows! There’s a pigeon habitat if I ever saw one. i am with arne. you guys keep dreaming about your fairy fantasy. A coat of paint is good, but some artistic whimsy combined functionality would be great, however, this isn’t it. Try again, please. I recall a fantastic scale model while at UK Architecture in ’87. It was a 10ft. long scale model with an entire open air park fit lengthwise in to the existing structure of the bridge. It culminated at the center with a small amphitheater that was placed sideways and cantilevered over both east and west edges. A meandering pathway which led from activity center to activity center also took a few interesting turns outside the main deck.